Hampton Inn & Suites Warrington in Warrington is a 3-star accommodation with a fitness centre equipped with cardio and strength training equipment. Among the facilities at this property are a 24-hour front desk and a business centre, along with free fiber WiFi throughout the property. All units at the hotel are equipped with a seating area, a flat-screen TV with cable channels and a private bathroom with a hairdryer and a bath or shower. 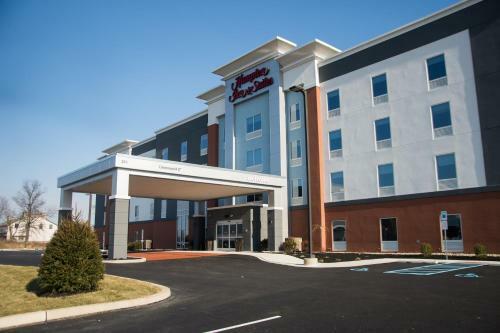 All guest rooms at Hampton Inn & Suites Warrington feature air conditioning, a refrigerator, microwave and a desk. An American breakfast can be enjoyed in the breakfast area. The hotel has a terrace and a heated indoor pool available year-round. Hampton Inn & Suites Warrington is located within the Valley Gate complex with restaurants and shops within walking distance. Philadelphia is 30 km from the accommodation, while Bethlehem is 49 km from the property. Philadelphia International Airport is 39 km away. the hotel Hampton Inn & Suites Warrington Horsham so we can give you detailed rates for the rooms in the desired period.